Atlanta hosted the 2015 AACC congress and Clinical Lab Expo. A vibrant event that successfully combines sessions with workshops and a busy expo, AACC was definitely the place to be for those with an interest in clinical chemistry. Significant breakthroughs were announced including a smartphone test for chlamydia that can detect the disease with high accuracy, potentially reducing its prevalence by making screening easier and cheaper (John Hopkins University BioMEMS Lab), as well as research on the first lab-on-cartridge device that can perform all common medical tests which will potentially help to expand access to basic medical testing in the clinical world (QDx InstaLab from DiaSys Diagnostics India). A big trend from the expo was around the ability to deliver laboratory quality results from wherever the patient is located (‘democratizing molecular diagnostics’ as Cepheid described it). Roche highlighted its cobas® Liat System to deliver results in approximately 15 minutes direct from a physicians office or pharmacy, whereas Cepheid focused on the GeneXpert® Omni especially for emerging markets but also for point of care. Both systems are incredibly small and portable, but Cepheid was keen to point out how cost effective the Omni is, at $2,895 (Roche would not divulge a price). Roche was able to announce that the FDA has granted CLIA (Clinical Laboratory Improvement Amendments) waiver for the cobas® Strep A, the first molecular PCR test to detect Strep A in throat swab specimens in ~15 minutes. cobas Influenza A/B* (and cobas Strep A) are both CE Marked and FDA cleared. Roche has also submitted the cobas Influenza A/B test for CLIA waiver. Cepheid is expecting Xpress tests for group A Strep & Flu/RSV in late 2016. There was a lot of buzz about the need to move from a fee/volume based healthcare system in the US to one of value. Diagnostics is at the heart of this as early, and more critically, correct diagnosis will enable more personalized and effective treatment for patients, potentially at a lower cost. Siemens dedicated its whole press conference to this topic, with David Fisher, VP of Healthcare Policy and Strategy at the company talking about how using diagnostics effectively (and measuring this accurately to clearly understand misdiagnosis) can optimize therapy while reducing overall costs, and therefore supporting value-based care. Personalized medicine was also talked about by a number of the vendors. They were all at pains to highlight that this was about the provision of the correct treatment that is most beneficial for each individual patient. A collaboration between Uniconnect (an LIS provider), MedcommsDx and Translational Software, sees a solution coming to market that enables MedcommsDx to perform genetic testing to enable physicians to provide personalized treatment models to patients. The LIS (launched in 2014) enables the data to be managed, and Translational Software pulls it into an easy to understand report. Lots of companies mentioned the prevalence of mass spectrometry (MS) in the clinical space. This is not a new topic, however, 2015 saw a big shift in that it is no longer just vendors such as Waters, SCIEX and Thermo Fisher Scientific banging the drum about the technology, but the labs themselves who are calling for it. This is evidenced by the fact that AACC launched MS3 this year, a workstream dedicated to MS in the clinical lab. SCIEX highlighted that with this increased call for clinical MS comes challenges, in that those who would benefit from this technology are generally not qualified less experienced in its use, leaving a big training need. The company has therefore focused on developing its training solutions, to provide more customized support for less experienced clinical users. Donald Mason, Scientific Affairs Manager for Health Sciences Diagnostics Group at Waters, explained that this strong emerging role for MS in clinical labs was due to the improved specificity and cost savings that are seen as a result. He highlighted a collaboration with the University of California San Diego Health System, where Judy Stone, Ph.D., Sr. Technical Specialist, Toxicology/Mass Spectrometry Laboratory has deployed Waters’ MassLynx software on her LC-MS systems Dr Stone highlighted that the MassLynx LIS interface is enabled for HL7 communications, one of the highly standardized formats that are commonly used in clinical laboratory interfacing, making MS easily within the grasp of any clinical lab. A number of companies talked about the ISO 15189 and CLSI EP23-A standards, which have for the first time highlighted that the focus now needs to be on patient safety rather than just the performance of the lab instruments themselves. This heralds the need for a more comprehensive QC solution. Bio-Rad launched the Mission: Control, which it claims is the first objective risk management software that helps laboratories to better assess the risk of reporting incorrect patient test results back to the physician. The company highlighted the shift in focus from lab instrumentation to patient safety as specified in the standards. This brings with it the need to assess more parameters than just instrument performance. A solution is required that also accounts for frequency of testing as well as potential patient risk. The Mission: Control software uses algorithms developed by Curt Parvin of Bio-Rad to do just this. The company also launched recombinant protein antigens that provide value and reliability for critical assay components that include Down's syndrome, ovarian cancer, infertility and heart attacks; as well as new Lyphochek Allergen slgE quality controls to monitor precision of in vitro allergy test procedures. Also highlighting patient safety was EMD Millipore with its AFS Water Purification Systems. Water is the most common reagent in a clinical lab, and therefore its quality is essential in ensuring patient safety, and for labs handling thousands of samples a day, the choice of a water purification system is key to providing high-quality pure water and smooth operations. The systems rely on two powerful technologies to produce water quality meeting Clinical and Laboratory Standards Institute® (CLSI®) Clinical Laboratory Reagent Water standards. Elix® electrodeionization (EDI) technology ensures constant water quality, while the E.R.A.™ (Evolutive Reject Adjustment) technology takes feed water quality into account in order to automatically optimize water recovery — and reduce water usage costs. In terms of technology, the biggest theme was around automation. “Fully automated’ were the buzz words of the week. Below we have highlighted some of the bigger new releases that really demonstrate walk-away power. 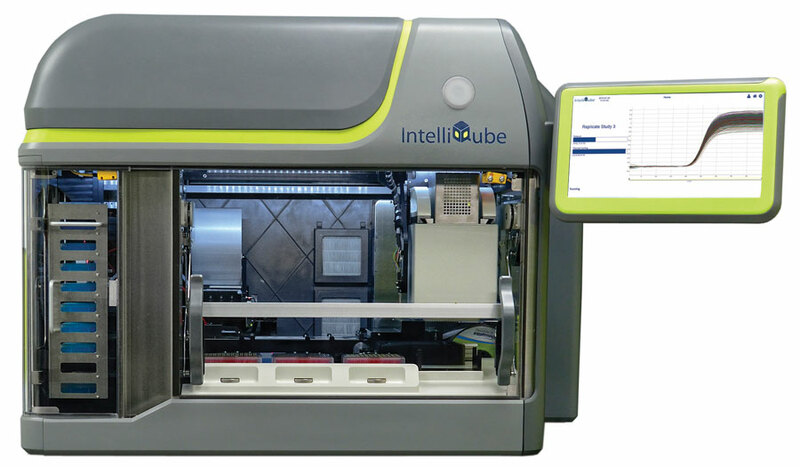 Douglas Scientific continues to innovate with the new IntelliQube that combines liquid handling with real-time quantitative (qPCR) and its renowned Array Tape consumable to automate liquid handling, thermal cycling, detection and data analysis. The fully integrated system not only brings the known benefits of a walk-away system, but is also cost effective, whilst maintaining high performance. The IntelliQube has a 768-well format that enables users to benefit from twice the PCR throughput seen with a traditional 384-well qPCR instrument. Combining this efficiency with the benefits of the Array Tape make cost one of the big selling points for this product. The Array Tape consumable is a microplate replacement (it is a polymer strip) embossed with reaction wells. As the wells are so small (most common is 2µl, which supports 1.6 µl) a saving of up to 90% can typically be seen on reagents and 50% on consumables. A per reaction cost is approximately 10c. The company was also able to respond to the query whether being faster and cheaper meant a compromise on quality by highlighting a recent study performed in collaboration with TATAA Biocenter. The study concluded that '...these data are evidence of excellent performance with a technical error negligible relative to the sampling error, virtually perfect PCR under optimum conditions, and a sensitivity to detect 1-2 template molecules per well'. 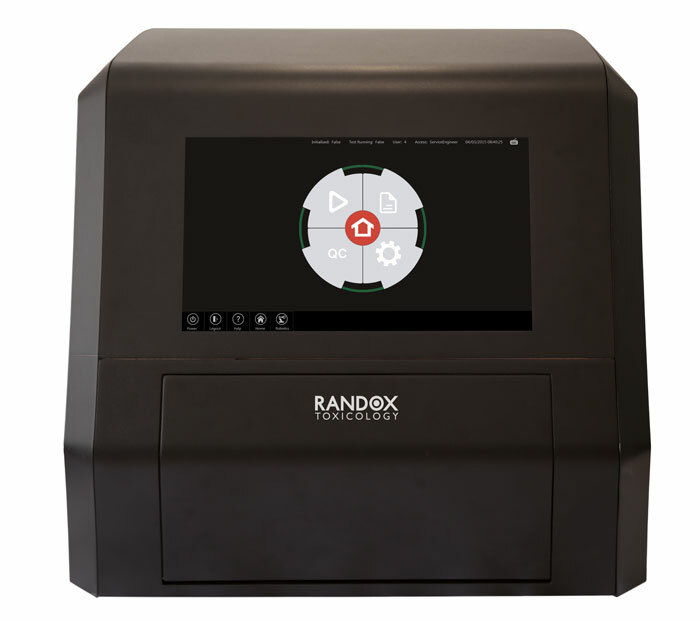 Randox showcased the RX imola, a cost effective clinical chemistry analyzer that it claims delivers consistent high quality results. Offering flexibility through its extensive dedicated test menu, the RX imola is capable of 400 photometric tests per hour or 560 tests per hour including ISEs ensuring unrivalled performance and rapid diagnosis. Eamon Lenehan RX series Marketing Manager explained "The RX Imola combines robust hardware, intuitive software and our extensive RX series test menu; guaranteeing precision, reliability and accuracy for results you can trust." Also highlighted on booth was the Multistat analyzer which aims to simplify the screening process for the user to allow accurate drug detection in a non-laboratory based setting. The fully automated Multistat offers a 15 minute turnaround time for Oral Fluid samples, testing for 20 drugs from one sample. The Multistat has been developed with ease of use as its focus, featuring a two-step fully automated process. The most buzz on the Roche booth was around the cobas®® Liat System and the Strep A test mentioned earlier, however, the company also launched the VENTANA HE 600 system, a fully automated H&E staining solution which reduces the risk of tissue cross contamination by using individual slide staining technology. The VENTANA HE 600 system also addresses the fact that many histology labs are concerned about the issue of hazardous waste, by producing 60-70% less waste than other automated staining solutions. The cobas® 6800 system was also unveiled on booth. Another fully automated solution for blood donor screening and clinical molecular testing (pending clearance), it is designed to deliver integrated automation and throughput with shorter time to results, providing greater flexibility for routine PCR testing. Visitors to the booth seemed to be most impressed with the simplicity of the user interface and that it can integrate easily into other elements of the workflow. Next generation multiplexing was the theme on the Dynex booth. The potential of these advanced systems has been limited by the complexity and cost associated with adopting new platforms that do not align with the needs of high throughput labs. The new Dynex Multiplier FLEX™ is a microplate-based fully automated technology that enables laboratories to easily convert from manual, semi or fully automated single analyte ELISA assays to fully automated multi-analyte assays. The Multiplier FLEX system is easy to use, cost effective and delivers results without the loss of sensitivity. Beckman Coulter Diagnostics focused on the announcement that it has received U.S. Food and Drug Administration (FDA) 510(k) clearance for its UniCel DxH v3.0 software, which supports automated connectivity of the UniCel DxH 800 and DxH Slidemaker Stainer COULTER Cellular Analysis Systems. The UniCel DxH Connected Workcell solution is now available for in vitro diagnostic use. The clearance enables laboratories to connect up to three DxH 800 analyzers to a DxH Slidemaker Stainer to create a customized, scalable workflow solution. The solutions Siemens showcased at this year’s AACC were designed to help customers successfully achieve their workflow and clinical goals, regardless of the size of their operations or testing demands. One such example, the ADVIA Centaur® XPT Immunoassay System, 1 it is a high-throughput analyzer that enhances workflow to meet the demands for reliable and rapid immunoassay testing. Recently FDA-cleared, this analyzer is designed to provide simple, continuous operation; accurate, timely results; and powerful, seamless connectivity including to Aptio Automation, the company’s flexible, track-based automation system. 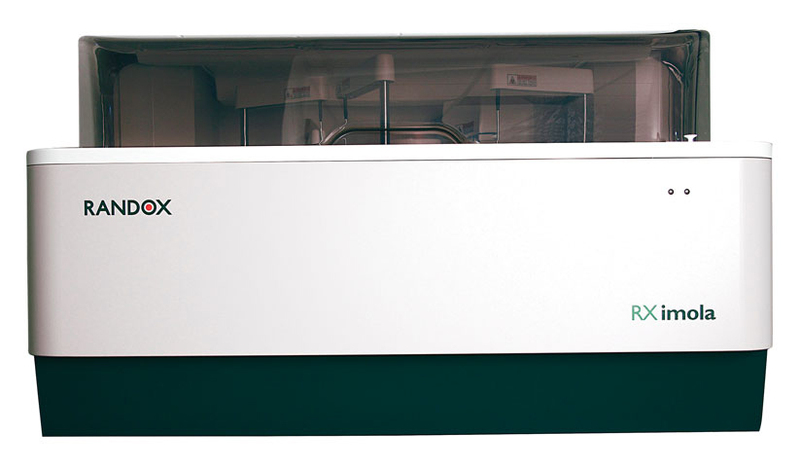 Aptio Automation’s newest diagnostic system connectivity options include the ADVIA Chemistry® XPT System, Siemens’ newest high throughput chemistry analyzer, and the Sysmex® CS-5100 Hemostasis System, a high-volume coagulation analyzer. The Sysmex CS-5100 is under FDA review and not yet available for sale in the U.S. Product availability varies by country. Siemens is the only single-source provider able to connect all four key laboratory disciplines—chemistry, immunoassay, hematology, and hemostasis—to the automation track. Innovator in glass as well as plastic for laboratories, Wheaton previewed its new technology that allows for the manufacture of plastic exterior components with complete interior coverage of pure glass. This breakthrough produces products that have the best of both worlds: the lightweight, break resistant properties of plastic with the barrier qualities and inert inner surface of pure glass. This is just a taste of the new products unveiled at AACC and Clinical Lab Expo this year, and sadly there is not enough space to cover them all. It is great to see so much innovation, but especially on the focus to make technology more accessible and easy to use. Automation and the democratizing of clinical diagnostics is truly enabling healthcare professionals to diagnose and treat diseases more effectively, whether that be more accurately, quicker, cheaper or, as in most cases, all three.